- Donna's life began as a magical reflection of Diana. After several months of playing with (and impersonating) Diana, Donna mysteriously disappeared. - Dark Angel, an enemy of Queen Hippolyta kidnapped Donna thinking she was her sister and forced her to live through a never-ending series of lives each filled with more tragedy and suffering than the last. The life that would become Donna Troy began with a series of tragic events. - Her mother died shortly after childbirth, resulting in Donna living in an orphanage. After adoption, her adoptive father was killed in an accident. - Her adoptive mother returned her to the orphanage where a staff member intended to sell her on the black market. - Donna was spared from a life of slavery and abuse by Rhea, Goddess of the Earth and mother of Zeus. She was taken to New Chronus to join eleven other unwanted children to become the 'Seeds' of the Titans - destined to ascend to godhood. - The 'Seeds' were imbued with great powers, trained thoroughly in combat and taught to appreciate the beauty of all life and the arts. - At 20, crisis had occurred and Donna was called on to help. Sparta, one of Donna's fellow Seeds had somehow recovered her pre-New Chronus memories and had been driven insane, hunting down her siblings and killing them off. - United with the other two surviving siblings, they faced off against their fallen sister and defeated her. The Titans of Myth gathered and thanked the three before granting them their full powers and freeing them to aid the universe as they wished. Free will. APPROVED: BACKGROUND_3 Becoming Donna Troy. Becoming Amazon. - Donna soon discovered she had all of her own memories from all of her horrible past lives. With these memories came realization of.. differences in the universe because of the Spectre's Judgment and subsequent lifting of Judgment. - The behavior that this newfound knowledge brought about in Donna was noticed by Dark Angel. She decided it was time to kill Donna once for all and she attacked. The battle was long and vicious but Donna won, removing all power Dark Angel had held over her once and for all. - After the battle, Donna found herself returned to the Earth immediately after the Spectre lifted his Judgment. - Settling into Manhattan, Donna discovered a love of photography and quickly refined her natural eye and talent for capturing the perfect shot. It was a creative outlet as well as a means of income and Donna emerged as a highly regarded and sought after young fashion photographer and photo journalist . - Donna was reunited with Diana and it became clear that the two were, indeed, mirror images of each other in appearance. Donna's powers largely seemed to match her sister but were also augmented by the Titans of Myth, allowing her to be more than just Diana's shadow. She was properly accepted into the Amazons by Queen Hippolyta and all of her Aunts, giving her a dual lineage. - Choosing to also honor her Titan benefactors, while returning to her duties as an Amazon, Donna chose to take the moniker Troia as her public heroic persona. Donna was born an Amazon, from Diana's very own spirit and memories at the time Magala cased the enchanted spell. Her loyalty to friends and family is ingrained from that 'birth'. There is little she would refuse for her true and closest friends, allies and family. Donna is pretty laid back as a person. Friendly and warm. She inherited that grace and poise from Diana no matter how long ago it was. Now it has begun to show in her career as a photo journalist and fashion photographer. Her rapport with others is remarkable. She can set her photography subjects at ease and work with almost anyone in short order. Donna has so many things to either atone for or to rise above. She longs to prove to her sister, Diana, that she is worthy to hold that honor and title. She knows the example that Diana sets for the world and desires to follow her sister's methods, making a name for herself as well. After all of the painful lives Donna was forced to life, she has a very sensitive out look on the suffering of others, particularly women. She seeks to help those who have been abused or are homeless above all others. Donna has just confirmed she is truly Diana's sister. That she is truly an Amazon, and that she has a place in this world forever free of Dark Angel. She wants to establish her photography and journalism career. She wants to help the Amazons. She wants to help those who have no voice of their own. The victims. Able to withstand direct attacks like crushing, blunt-force or impact trauma from just about any peer (Diana, Power Woman). Not immune to piercing damage - bullets, needles, blades etc. She is also immune to extreme temperatures. Given improved senses by the Titans of Myth: Acute sensory functions much like the greatest predatory animals that roam the Earth. Donna is a mirror image of Diana. She developed differently after being taken by Dark Angel, yet she is still her sister's equal even in strength - able to lift ~100,000 tons. Can exert maximum effort for eight hours before beginning to tire. When fully exhausted she only requires a few hours of rest. Can continue for days without sleep if she paces herself. Can slow her heart rate down to almost nothing, seemingly dead, and use little oxygen. Highly resistant to disease and viral infection. All but immortal and ages very slowly. Can recover from injury more quickly than a normal human. Donna is capable of self sustained flight and can achieve Earth escape velocity (~24,614mph/~Mach 32) in atmosphere as well as sustained galactic flight and near-light speed. Immune to effects of high altitude or zero-gravity including dizziness or low/lack of oxygen. Has the ability t "encourage" others to tell her the truth and they will (largely) desire to do so. Can sense when they are lying or speaking the truth. Powerful blasts of photon energy able to blast through reinforced concrete walls two feet thick and rend even high carbon steel. Can create an energy shield that protects her from energy or heat damage but cannot stop kinetic energy such as bullets. The shield protects against radiation especially in the vacuum of space. Trained for years on New Chronus in combat by Rhea and the Titans of Myth. Donna's innate Amazonian heritage combined with the powers of the Titans of Myth to make her very deadly and capable hand to hand combatant. Skilled as a leader and a tactician in deploying forces. It is not a role she prefers to take but she will do so when there is a need. She understands the theories of battle tactics from just a few warriors to an entire army. Taught how to move within her surroundings to better defend herself when it became necessary. Not quite the acrobat Nightwing is, Donna knows how to roll with punches and perform dives and rolls and flips. A charisma that draws others to her and makes others enjoy being around her. It often means others come to for advice. Trained in the use of martial weapons. When combined with her abilities, it can make firearms look obsolete. The lasso and javelin were the ranged weapons Donna became attached to though not a novice with a bow. With melee, always prefers a short sword and shield but also dangerous with long sword. Skilled in the use of shields for defensive and offensive fighting. Having been on her own for many years, she has become an accomplished cook given the many cultures she has experienced. Her common styles are Mediterranean in nature but she also enjoys many other styles as well. Understands how to survive in hostile situations and environments. She is no EMT but can to stop bleeding, set bones and live off herbs and plants for medicine or food. She knows how to hunt and create shelter. Educated in much of the same ancient lore and art as any child of the Greeks or Amazons by the Titans of Myth. The love of the same arts and philosophy runs deeply through Donna's being and was only magnified in reuniting with Diana and the Amazons. Until she defeated Dark Angel once for all large parts of Donna's memory were blocked from her recollection. Now with this knowledge and the memory of her origins she is still discovering the woman she wants to be. And there are times where the memories conflict, causing uncertainty and confusion. Donna tends to be a little naive when it comes to looking for good in others, enemies or otherwise. She is learning to be more 'worldly wise' and cautious rather than just trusting that the first thing she is told by someone she does not know is absolutely true. Her creation from Diana bound Donna with the same curse. Even though she was given most of her power and strength from the Titan Rhea, if she wrists are bound she will lose all of it and be no stronger than a normal human woman. Donna is fiercely loyal to her friends and family. This is just as much a blessing as it is a curse but, just the same, she can be counted upon to come to the aid of any friends or family — even when it's an obvious trap. Given the countless lives Dark Angel forced Donna to experience through reincarnation that involved abuse, often violent, the things sure to set her temper off, that she will absolutely not tolerate, are misogyny or violence against women in any form. For those with an eye on public information: Donna Troy is recognized as a very talented photographer and photo journalist. She has a large library of work and has been known to work in fashion circles, particularly during the large shows each season. She has worked with many of the large fashion and design houses in the industry and has done photo essays on more humanitarian topics in many third world countries, often documenting things most would prefer to ignore or pretend is not a part of the world they live in. For those who know more about Amazon history: Donna Troy is an Amazon, she is Diana's sister though details of how that came to be are not for public consumption. For those who know of New Chronus and the Titans of Myth: Troia is one of the saviors of the planet and its gods. 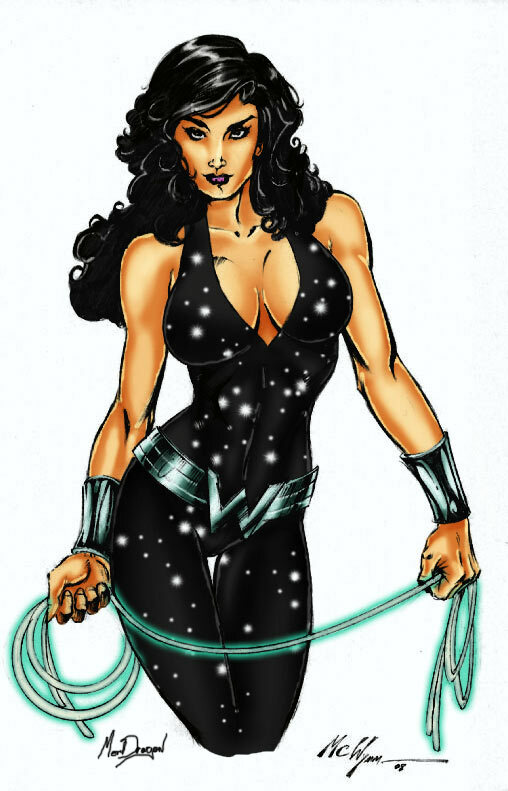 For those who know of mythological religions and deities, Donna Troy/Troia is technically a goddess of New Chronus as well as through her Amazon heritage as the mirror twin of Diana, bearing part of the same spirit imparted and empowered by the gods and goddesses of Olympus.